This is probably the biggest single story posted on this blog since it started in May-08. 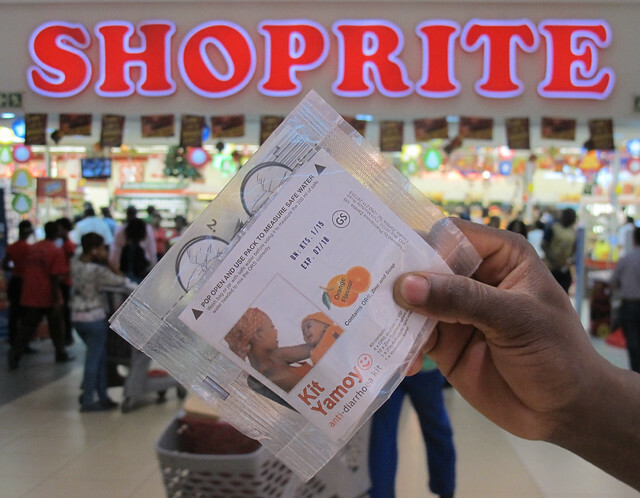 From December 2015, Shoprite stores across the whole of Zambia will stock the Kit Yamoyo anti-diarrhoea kit. This is the biggest event in Zambia’s history with regard to providing access to ORS and Zinc for the home treatment of diarrhoea and will, quite simply, save hundreds of lives. The world knows how to treat diarrhoea – the current international standard (ORS and Zinc) has been in place for 10 years – and yet less than 1% of children in sub-Saharan Africa get this treatment and diarrhoea remains the second biggest infectious killer of under 5 children. Now, in Zambia, parents and caregivers will be able to get a world-class, locally manufactured, co-packaged ORS and Zinc kit, in an award-winning pack at their local Shoprite store. People trust the Ministry of Health and the Ministry of Community Development Mother and Child Health who have overseen and advised ColaLife’s projects in Zambia, since we started work in Dec-11. We extend thanks to all their staff, without whose enthusiastic and visionary support we would never have succeeded. People trust the Medicines Regulator of Zambia (ZAMRA), who have provided us with supervision and support throughout. People trust our NGO partner, Keepers Zambia Foundation, who have now spent four years getting local leaders and government officials across most of the country behind Kit Yamoyo, training and supporting shopkeepers to sell it and Community Health Workers to promote it. With stores in every province, 22 stores in all, no other commercial chain gets close to Shoprite when it comes to reach: putting affordable, quality products in front of people. Pharmanova, who now manufacture both the ORS and Zinc, and assemble the kit in Lusaka, has a huge reputation when it comes to locally produced quality medicines, and had the vision to back ColaLife’s design concepts from the outset. This is just a handful of the hundreds of people who helped ColaLife to achieve this, and got us where we are today: well on the way to establishing Kit Yamoyo as a viable and sustainable product in Zambia. We’ve tried to list all of our supporters here and again we thank you all. This momentous event will be celebrated at a press launch on Friday next week (27-Nov-15) with the Hon Minister of Health, Dr Kasonde, present as guest of honour. The event will be designed to get as much local media coverage as possible and will be hosted at the British High Commission, home of DfID, here in Zambia. DfiD – the UK’s Department of International Development – has been ColaLife’s majority funder since the start of the Kit Yamoyo trial phase in Dec-11. A press release will be available from tomorrow (20-Nov-15). Meanwhile, in our continual effort to reach the poorest close to where they live, our two current projects continue to train small retailers in far-flung villages and crowded urban ‘compounds’, and work with the Ministry of Health on free distribution though Health Centres – thus giving Kit Yamoyo multiple channels to market. I am sure your approach to developing multiple channels, will continue to bring even more fantastic results in future.